This is an alphabetical list of the main rivers in Ireland as a whole. It includes rivers that flow through the Republic of Ireland and Northern Ireland. Rivers that flow through Northern Ireland are marked with an asterisk (*). There are over 70,000 km of waterways in the Republic of Ireland contained in 3,192 river water bodies including rivers, streams, and tributaries. The major rivers have their length (in miles and kilometres) given. Also shown are two tables. Table 1 shows the longest rivers in Ireland with their lengths (in miles and kilometres), the counties they flow through, and their catchment areas (in km2). Table 2 shows the largest rivers in Ireland (by mean flow) in cubic meters per second. 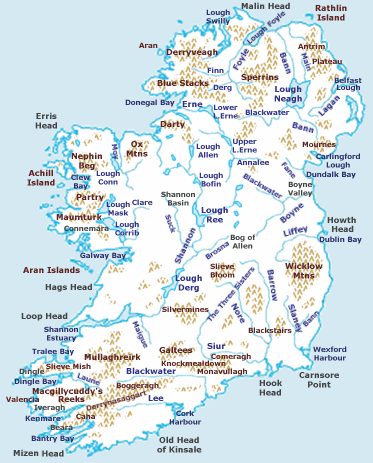 Some of the larger or better known rivers of Ireland are shown on this map (large version). The length of the River Shannon from the Shannon Pot to Limerick City is 258 kilometres (160 mi) with a basin area of 11,700 km2. The River Shannon's overall length (to Loop Head), using the Owenmore River (County Cavan) as source, is 372 kilometres (231 mi), 11 km (7 mi) longer than the Shannon Pot source. The River Shannon's overall length (to Loop Head), using the Boyle River's furthest source, is 392.1 kilometres (243.6 mi), making the Boyle-Shannon river the longest natural stream flow (source to sea) in Ireland, 31.6 km (19.5 mi) longer than the Shannon Pot source. The River Shannon is a traditional freshwater river for just about 45% of its total length. Excluding the 102.2-kilometre (63.5 mi) tidal estuary from its total length of 360 kilometres (224 mi), if one also excludes the lakes (L. Derg 39 kilometres (24 mi), L. Ree 29 kilometres (18 mi), L. Allen 11 kilometres (7 mi) plus L. Boderg, L. Bofin, L. Forbes, L. Corry) from the Shannon's freshwater flow of 258.3 kilometres (160.5 mi), the Shannon as a freshwater river is only about 160 kilometres (100 mi) long. The total basin area of the Three Sisters (Barrow, Nore and Suir) is 9,207 km2. The traditional length given for the River Bann is 80 miles (129 km) which is the combined total length of Upper and Lower Bann rivers and doesn't include Lough Neagh. The total length of the Ulster Blackwater from its source to the sea via L. Neagh and the Lower Bann is 186.3 km (115.75 mi), surpassed, in Ireland, only by the Shannon and Barrow rivers. This is the longest stream flow (source to sea) in Ulster. The total length of the River Robe's journey from its source near Ballyhaunis to Galway Bay (via Lough Mask, Cong canal and river, Lough Corrib and River Corrib) is 72 miles (116 km). This is the longest stream flow (source to sea) within the Corrib Basin. b The River Bann's 92 m3/s is to Movanagher Gauging station (Basin area 5209.8 km2). The 102.5 m3/s is based on the total basin area of 5808 km2 . c The Three Sisters (Barrow, Nore & Suir) total flow into Waterford Harbour is 154 m3/s and the combined flow of the Barrow and Nore rivers is 86 m3/s before joining the river Suir near Waterford City. Bann* 90 miles (140 km) — longest river in Northern Ireland. Upper Bann flows into Lough Neagh and then continues north as the Lower Bann. Pollymounty River, County Carlow, also spelled Pollmounty or Poulmonty. River Shannon 224 miles (360 km) — longest river on the island. Develops into Lough Allen, Lough Bofin, Lough Ree and Lough Derg along its course. ^ EPA Water Quality in Ireland 2010–2015, Section 2.1, page 10. Environmental Protection Agency, 2017. ISBN 978-1-84095-735-8.